China wants to build hundreds of ski resorts and skating rinks – effectively a whole new winter sports industry – ahead of its turn hosting the Olympics. The aim is to breed a new generation of athletes to win big at the 2022 Winter Olympics in China. The country wants to look good in front of a home audience. An expert told Business Insider it might not work, no matter how much they invest. China is investing billions of dollars into new ski resorts, skating rinks, and athletics programs to breed a new generation of athletes that can help it win big in the 2022 Beijing Winter Olympics. The country wants to build 800 ski resorts and 650 skating rinks by 2022, when it will host the next Winter Games, the state-owned China Daily newspaper reported. China unveiled the ambitious project in 2015, when it was chosen to host the 2022 Winter Olympics. The plan is to create 300 million skiers, skaters, ice hockey players, and other winter athletes within the next few years – some of whom will represent the country in four years’ time, when the country’s status as host will allow it to enter athletes into every single discipline. 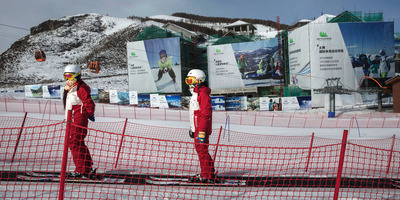 Its plans effectively amount to constructing an entire winter sports industry in the run-up to the next Winter Olympics. Kevin Frayer/GettyChinese ski instructors at the Thaiwoo Ski Resort, which opened in 2016 and will host some of the events at the 2022 Winter Olympics. This photo was taken in January 2016. China made its newfound enthusiasm for winter sports official in 2016, when it published its five-year National Fitness Program – a 1.5 trillion renminbi ($US237 billion/£169 billion) plan unveiled in 2016 to reinvigorate the country’s fitness industries. The plan highlighted the importance of winter sports, such as skiing and figure skating, and called for new facilities to cater to them. Since the plan was announced, real estate developers have built massive new facilities to meet the country’s demand for winter sports. Coaches from places like Britain and Canada have flocked there to make a living. According to China Daily, the number of ski resorts in the country rose from 300 to 700 between 2014 and 2017 alone. China is also building new high-speed trains to shuttle skiers from Beijing to Chongli, a town in the northern Hebei province where most of the 2022 Games events will take place, the LA Times reported. 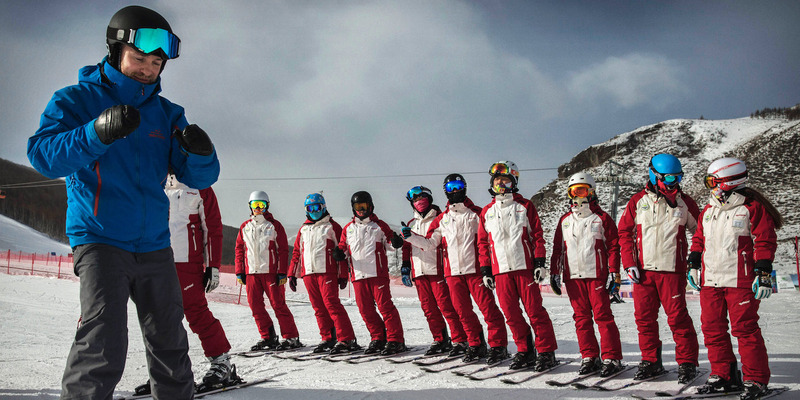 What’s behind China’s new obsession with winter sports? The main reason is to win big and look good in front of a home audience in 2022. The country invested heavily in grooming its athletes for the 2008 Summer Olympics in Beijing, David Dollar, a China expert at the Brookings Institute, told Axios. It appeared to pay off – the country ended up taking the most gold medals that year, effectively winning the games. Kevin Frayer/GettyA Canadian ski instructor coaches Chinese ski instructors at the Thaiwoo Ski Resort in January 2016. China’s ambitions for winter sports go beyond the 2022 Games, however. As the country becomes richer, the government hopes to turn winter sports into a sprawling new industry. Authorities expect China’s winter sports industry to be worth 1 trillion RMB ($US158 billion/£113 billion) by 2025, the South China Morning Post reported. As of last year, it was worth around 397 billion RMB ($US62 billion/£45 billion), the China Daily said, meaning the industry would need to almost triple in size to meet the target. So will China win big in 2022? Dreyer, the Beijing-based sports journalist, said there is “no chance” China will win the 2022 Games – but it could still manage a large medal haul. China is unlikely to win in the more traditional – and by extension more competitive – winter sports, like downhill and slalom skiing, he said. However, it might have a chance in the newer or less popular ones, such as freestyle and mogul skiing, snowboarding, and curling. “On a wider level, China has targeted a goal of having 120 million skiers and 180 million skaters by an unspecified date. These are ludicrously overambitious targets, but if China only succeeds in achieving a fraction of these targets, it could still have one of the largest winter sports bases by population in the world.